With Marvel collections, hoopla continues building "a digital home for comic book fans"
HOLLAND, Ohio, Dec. 8, 2017 /PRNewswire/ -- hoopla digital (hoopladigital.com), the category-creating mobile and online service for public libraries, today announced a new agreement with Marvel Entertainment that adds over 250 collections and graphic novels to the service. Through this agreement, patrons of participating public libraries can now borrow Marvel works like, THOR: GOD OF THUNDER VOL. 1, BLACK PANTHER: A NATION UNDER OUR FEET BOOK 1, CIVIL WAR and X-MEN: THE DARK PHOENIX SAGA via hoopla digital on their smartphones, tablets and computers. Marvel content arriving on hoopla digital includes heroes and villains that have been a part of Marvel's blockbuster films and acclaimed television shows, including THE AVENGERS, GUARDIANS OF THE GALAXY, SPIDER-MAN, DAREDEVIL, PUNISHER, and THE RUNAWAYS. Marvel's collections add to hoopla's catalog of more than 600,000 movies, TV shows, music albums, eBooks, audiobooks and comics. "Through this agreement, we are building a digital home for comic book fans where they can find all their favorite characters and have instant access to hundreds of acclaimed works – all with a library card. No collection would be complete without the iconic work of Marvel Entertainment," said Jeff Jankowski, founder and owner of hoopla digital. hoopla digital's comics experience showcases Action View, a one-of-a-kind, immersive digital reading experience that allows for full-page and panel-by-panel views of comics and illustrations. "We're thrilled to be part of hoopla digital and to expand our reach to library patrons across North America. 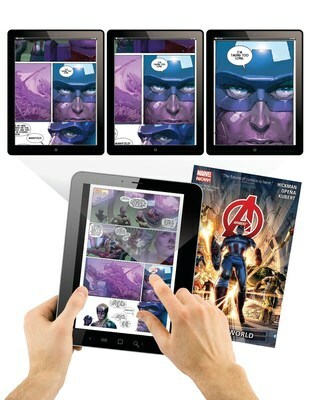 It's a terrific way to connect with our fans and engage with a broader audience on a platform that provides a unique experience for comic book readers through innovative technology," said Marvel's Julie Gerola, VP/GM of Marketing & Digital Operations. hoopla digital has partnerships with more than 1,600 public library systems across North America including Boston Public Library, Free Library of Philadelphia, Chicago Public Library, San Francisco Public Library, Los Angeles Public Library, and Edmonton Public Library. hoopla digital is a category-creating service that partners with libraries across North America to provide online and mobile access to thousands of movies, TV shows, music, eBooks, audiobooks and comics. With hoopla digital, patrons can borrow, instantly stream and download dynamic content with a valid library card. All content is accessible via hoopla digital's mobile app and online at www.hoopladigital.com. hoopla digital is a service of Midwest Tape – a trusted partner to public libraries for over 25 years.